The Union Flag and European Union flags fly near the Elizabeth Tower, housing the Big Ben bell, during the anti-Brexit 'People's March for Europe', in Parliament Square in central London, Britain September 9, 2017. BRUSSELS - As in-fighting consumes the British government, Europeans have stepped up quiet preparations for a possible collapse of Brexit talks that could see Britain crash out of the EU without a deal 18 months from now. Prime Minister Theresa May’s EU counterparts still see the “no-deal scenario” she threatened them with as most unlikely, as they think it would hurt Britain much more than the continent. But after her faltering party conference this week and ahead of important meetings in Brussels over the next fortnight, diplomats and officials there and in big member states said they have been putting renewed focus on contingency planning for a legal limbo in March 2019 and urging businesses to do the same. German officials say that in recent months they have been spending just as much energy on how to handle that as on preparing for a negotiated solution. The BDI industry federation in the biggest EU economy warned German firms on Thursday that it would be “naive” not to be ready for a “a very hard exit”. Like May, who on Friday rejected calls from some lawmakers to resign, Michel Barnier, the European Union negotiator, says his aim is an orderly exit. But he repeatedly cautions that he also has a mandate from EU leaders to help prepare for failure and regularly tells businesses to be sure to plan for the worst. “We want to be ready for all eventualities, including ‘no deal’,” he told business and labor representatives after the negotiations began in July. Deal or no deal is “the fundamental question”, he said, after talks made little progress in August. “This is the growing feeling, absolutely,” a senior EU official said of concerns that talks could collapse, not because Britain saw economic advantage in that, as May has warned, but because British politics could end up in domestic stalemate that could mean missing reasonable deadlines for a withdrawal treaty. For many, talk of a breakdown in talks remains part of the bluff and counter-bluff of negotiations. But what May’s problems inside her own government indicate to many across the Channel is that the country is so divided it may be unable to reach a deal. People close to Barnier’s negotiating team draw attention to new legislation last month aimed at protecting the EU carbon market from a disorderly British departure and moves to force euro-denominated securities clearing from London to the continent as examples of Brussels’ contingency planning. May’s Brexit minister, David Davis, is expected back in Brussels on Monday for a fifth round of negotiations with Barnier. But expectations among EU officials are low to nil for a breakthrough on key divorce issues that would allow EU leaders to tell May when they meet her the following week that they are willing to open talks on a future free trade accord. Aside from uncertainty over how a new EU border with Ireland will work and differences over rights for expatriates after Brexit, a standoff over tens of billions of euros that Brussels argues Britain will owe on departure seems far from resolution. Describing as “unbelievable arrogance” British offers to pay just 20 billion euros ($23 billion) of a “Brexit bill” which the EU estimates at perhaps 60 billion euros, a senior diplomat from a country Britain generally views as an ally in EU affairs said May would have to face down hardliners who reject such payments. Few of Britain’s negotiating partners see any benefit in a change of prime minister now. That would cost more time that neither side has, since the chances of London or Brussels agreeing to extend the Brexit deadline seem limited. “With Boris Johnson as prime minister, the negotiations would be easier,” one EU diplomat said of the foreign secretary, who has sniped at May’s push for a deal that could see Britain stay bound by some EU rules, at least for a transition period. For many, ending with a legal void remains far-fetched. But though British ministers talk of a “bespoke” deal to exit EU rules while retaining market access, EU officials warn that time is running out for London to find any option other than to agree to something like the status of Norway -- being in the EU market and accepting rules on which is has no vote. 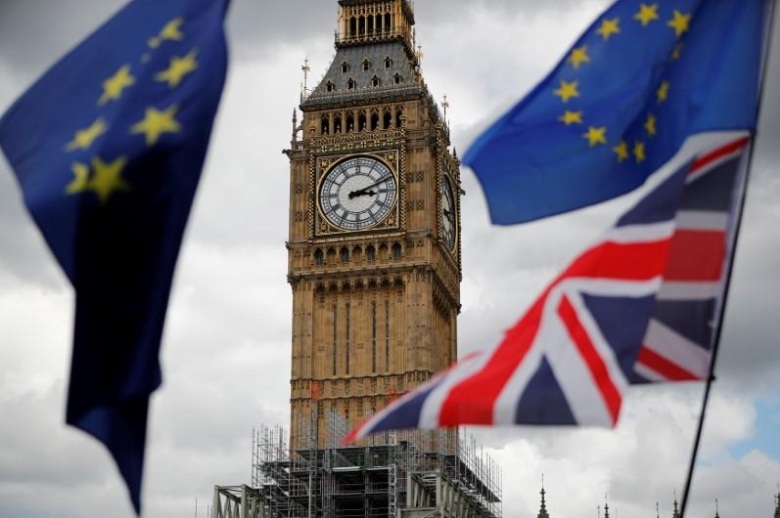 As in-fighting consumes the British government, Europeans have stepped up quiet preparations for a possible collapse of Brexit talks that could see Britain crash out of the EU without a deal 18 months from now.